The Hotasa Puerto Resort Canarife Palace is situated in the La Paz area of the Puerto De La Cruz resort, this lovely 4 star hotel is coupled with another 3 star hotel where the guests all share the features of both hotels. The Canarife Palace is the 4 star hotel and offers the choice of an indoor and outdoor swimming pool plus a multi sport court where sports fans can really get their game on in the sun. There are three restaurants on site and serving up traditional and international food to the guests whilst there are seven different bars on hand to serve a whole range of drinks and snacks to all the guests. The pools have their own bar and you can relax in style on the lovely sun terrace. Your room also has its own private balcony or terrace and your own ensuite for privacy. Those who want to explore the resort and nearby towns have full access to the free shuttle bus service from the hotel there are also extra buses and taxis nearby. 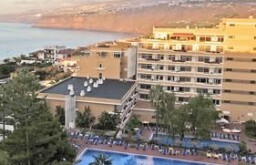 An excellent base of operations for a holiday exploring Tenerife that is really beautiful and well looked after to keep you as comfortable as possible on your holiday.